Last time I dined at The Spare Tire, I sat under a full-size crocodile hanging on the wall. I enjoy the eclectic decor in the bar with silver, pewter and gold painted tires hanging on the wall. On the ceiling is an interesting black and white mural above a wall decorated with posters of Marilyn Manson, Rolling Stones, Jim Morrison and the Ramones. 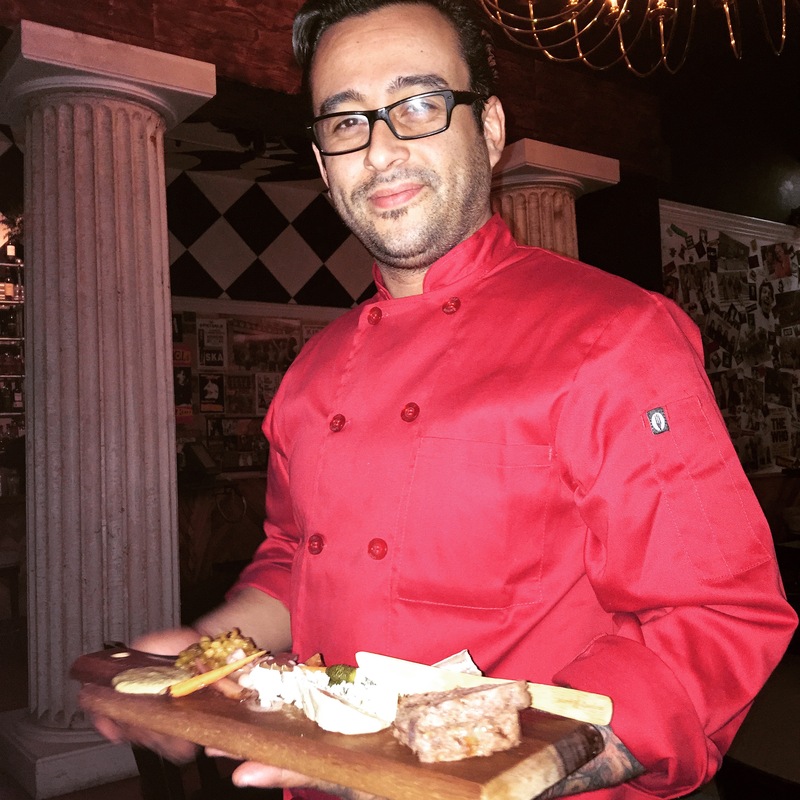 Executive Chef Isaias Peña Spring/Summer menu offers a multitude of international flavors. “I focus on dishes I likes to eat. I have also included more gluten-free and vegan dishes,” Isaias said. On his new menu there are at least 14 gluten-free plates that include five grilled pork belly lollipops on long skewers served with a citrus gastric; squash blossoms stuffed with goat cheese and an interesting prosciutto and fig stuffed quail with a Sherry pan sauce. For some hearty fare, try the chicken and waffles stuffed with gorgonzola and bacon and served with a rosemary syrup or the pub burger with smoked cheddar and bacon. From the sea section on the menu, Isaias creates octopus carpaccio, seared scallops with black gnocchi, pan seared halibut with a purple cauliflower puree and New Zealand green mussels cooked in Alagash Belgian white with orange, garlic and butter. Bring your friends to share one of the wood-fired pizzas, there are at least ten different pies, such as the new Bahn Mi with pork belly, peanut sauce, mint, carrots, cilantro and bean sprouts. 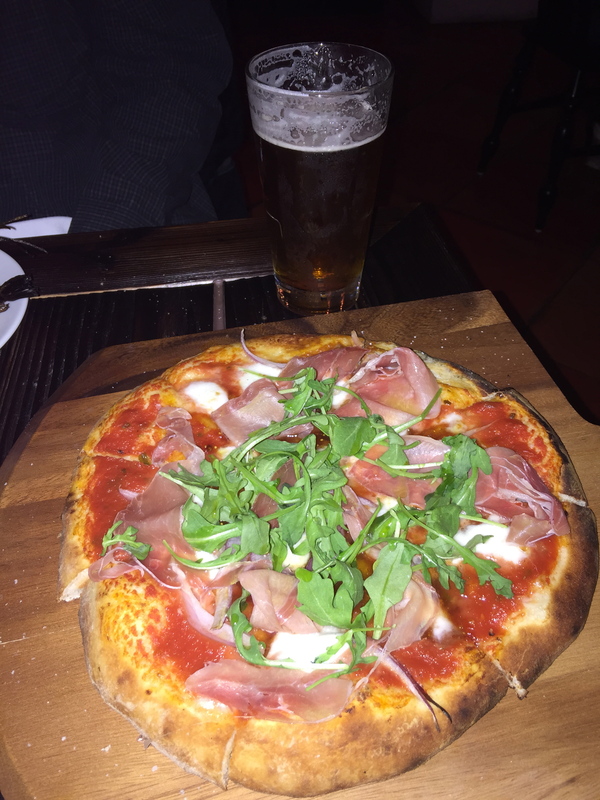 I was pleased to see that they still make my favorite pizza with a delicious fig jam as the sauce on the dough, then covered with prosciutto, red onion and arugula. The saltiness of the prosciutto and sweetness of the fig jam is a dynamite combination. The pizza pies pair well with one of the 20 draught beers, 15 varieties of bottled and 5 cans of beer. The bar makes a mint julep. Rob Roy, Manhattan, Old Fashioned, Dark and Stormy and a variety of mules. I was happy to see on the menu the heirloom farro salad with roasted butternut squash, black truffle, and boschetto cheese. It’s topped with greens and aged balsamic vinegar. The hanger steak with small Yorkshire pudding popovers is gone. It’s been replaced with a 16 oz. Cowboy ribeye and short ribs with blue cheese butternut risotto. The lunch menu has a multitude of entrees, salads and sandwiches that include a Thanksgiving sandwich, Chicago Italian beef on a French roll and a beer battered fish filet. Spare Tire Kitchen & Tavern is open for lunch, happy hour, dinner and late-night snacks from 11:30 a.m. to 2 a.m., Thursday through Saturday; and from 11:30 a.m. to midnight, Sunday through Wednesday. $$ 5370 Wilshire Blvd., (323)525-2618. This article is featured in the 2015 Beverly Press Dining and Entertainment Guide.